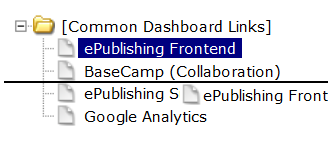 ePublishing Knowledge BaseePublishing Knowledge BaseePublishing Knowledge Base Common QuestionsHow can I control the Common Links shown on my dashboard in my Admin tool? This is your area to place links that will help your team support your website. This simple little menu can have real benefits in helping your team update your website and quickly access all of the partners that help support it. Where are these links on my Admin tool? 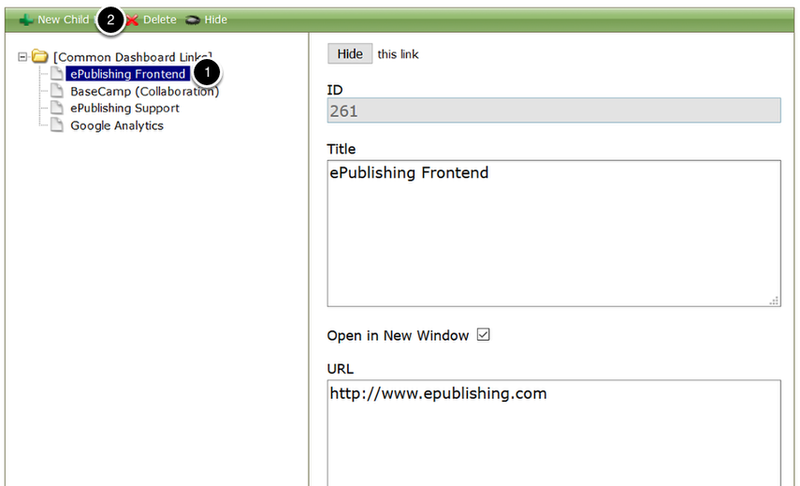 To view these links, click on Dashboard on the top left of your Admin tool. How can I change them? First, open your Navigation Manager found under Editorial. The Navigation Manager for each website has a menu called Common Dashboard Links, which will allow you to Add / Update / Delete any of the links you want your team to easily access. We recommend adding any links to third-party vendors, sites, support, and your site documentation. 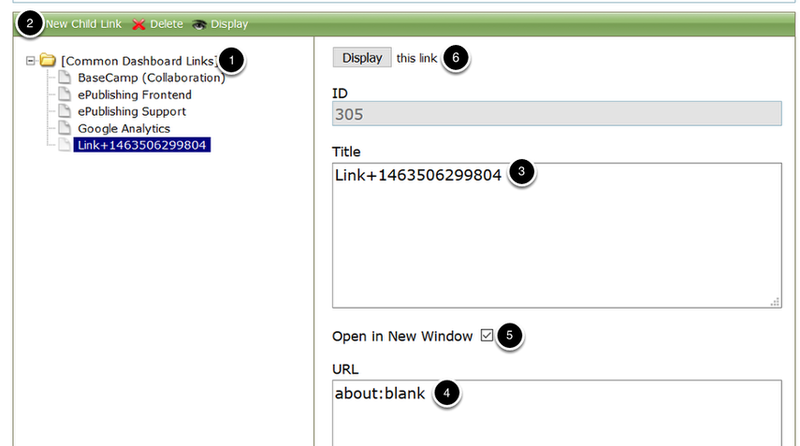 Enter "Common Dashboard Links" in the textbox then click Create. The new menu will appear in the list and you can continue with the instructions below. 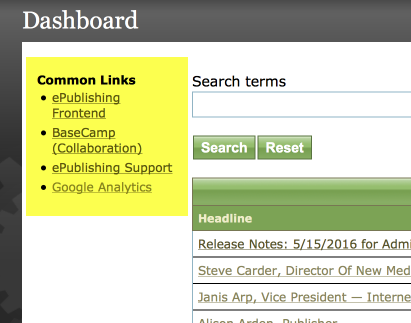 Zoom: Select Common Dashboard Links. Click the "+" sign to open up the links. On the right, update the Title you want displayed for that link. For example, Ad Server. Paste the URL under URL. Select the checkbox next to Open in New Window. Click Display this link at the top. Be sure to scroll down and Save when finished. Click on the link you'd like to update. On the right, update the information you need to modify. You can modify the Title or the URL. Scroll down and click Save to retain your changes. Click on the link you'd like to delete. Click Delete. Click OK when the dialog box pops up and asks if you want to continue. You can also Hide a link by clicking Hide on the right side. Click on the item you'd like to move and drag. A line will appear where your item will be placed upon releasing your mouse. 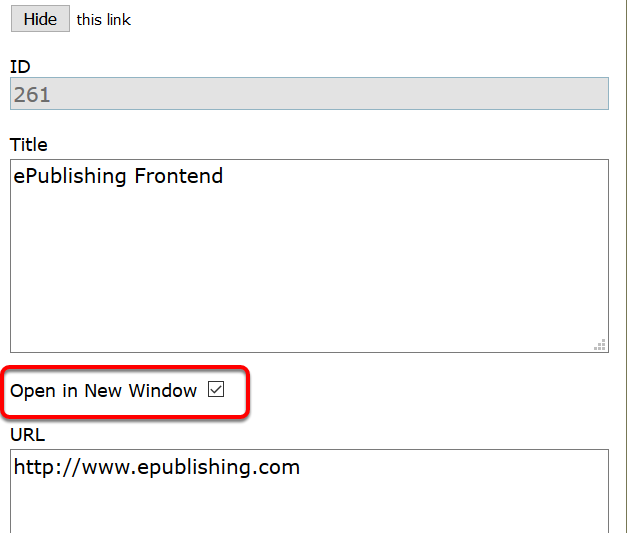 Final thought: As a best practice, make your links open in a new window by clicking the checkbox next to Open in New Window. When finished, click Dashboard to view the updates. Prev: Help! I can't get into the Admin tools with my login! 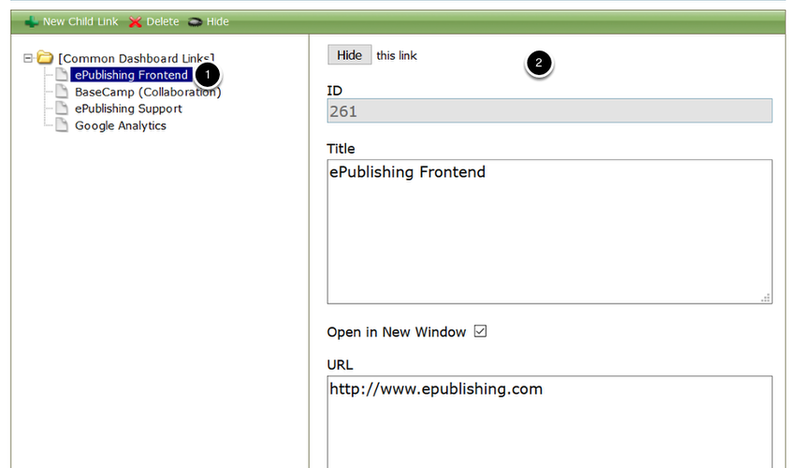 Next: How do I grant access to ePublishing to access my Google Analytics?